The South Korean and US defense chiefs will hold annual security talks in Washington on Wednesday amid concerns that an alleged gap between the two countries’ approaches to North Korea might pose a challenge to the decades-old alliance. Defense Minister Jeong Kyeong-doo and his US counterpart, James Mattis, will attend the 50th Security Consultative Meeting, with senior diplomats and defense officials joining the bilateral consultation held annually since 1968. The Ministry of National Defense said the bilateral meeting will address “extensive security issues,” including how to achieve the goal of denuclearizing North Korea. The issue of suspending a joint military exercise and transferring wartime operational control will be discussed as well. There has been mounting concern that Seoul and Washington may have different priorities in their efforts to bring about North Korea’s denuclearization. While the US insists on maintaining pressure with sanctions, Seoul is leaning toward at least partial sanctions relief to speed up inter-Korean projects. Most notably, the two countries reportedly clashed over the inter-Korean comprehensive military agreement signed after the Pyongyang summit last month, with US Secretary of State Mike Pompeo taking issue with South Korea’s plan to establish a no fly-zone over the cross-border region. Faced with possible points of contention, South Korea and the US are seeking to use the Security Consultative Meeting as a platform to coordinate their efforts to deal with North Korea’s nuclear program and other transformational security challenges in the Asia-Pacific region. 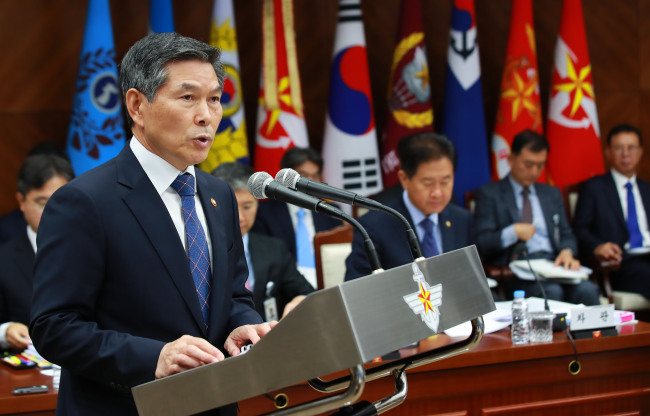 “In the past 50 years, the SCM has grown into the symbol of the (South Korea-US) Alliance; an irreplaceable consultative mechanism that has ensured security on the Korean Peninsula,” said the joint commemorative statement. Among the items to be discussed at the Security Consultative Meeting is the fate of joint military exercises, including Vigilant Ace, on which Seoul and Washington have struck a different note since the US announced the suspension of the exercise previously slated for December. While the Pentagon said Seoul and Washington suspended the exercise to “give the diplomatic process every opportunity to continue,” the Defense Ministry claimed the suspension has yet to be finalized until the two countries’ defense chiefs reach an agreement. At the talks, the allies are also expected to come up with a specific road map for the implementation of the transfer of wartime operational control and organize a future combined command structure. The “future command” will replace the current US-led Combined Forces Command, under which its four-star general serves as a commander. Under the new structure, South Korea’s four-star general is expected to assume the commander’s role, while the US general will serve as the deputy.